We love Ellen as you have now gathered and we really want to give her a warm Aussie welcome and would love it if you left your message welcoming Ellen to Australia below. Please keep all comments clean and in a positive tone because that’s what Ellen is all about. We hope that she’ll visit our website and enjoy what we’ve created for her and read your messages of welcome. This is her first trip Down Under and we want it to be incredibly memorable and joyous as possible. Thanks so much for visiting us and helping us spread the Ellen Joy to as many people as we can touch. It's great to start seeing the footage filmed in Australia. Fantastic news about Finding Dory. It looks like yesterday was such a fun day. I'm sure everyone who was there enjoyed themselves including Ellen and Portia. I didn't win a ticket on the big yellow bus and am unable to be in the city tomorrow so I hope all of the other people there have a fantastic time and give you the Sydney welcome that you deserve. I did my bit by ordering the beautiful weather for you. We have a gorgeous harbour don't we? Have a lot of fun and dancing during your stay Ellen. I hope you are getting better Ellen. I can't wait for your arrival in Sydney later in the week. Here's hoping I have the chance to see you. Ellen, I had tears of happiness when I saw the announcement of the new Covergirl. What a remarkable young lady she is and a credit to her family. She thoroughly deserved to win. I do hope that you have had a chance to see this magazine. It is lots of fun and I hope Sam and Bronny get a chance to meet you. Sounds like lots of fun happening in Melbourne at the moment. I'm looking forward to seeing the show here in Oz tomorrow to see it all. I love your hair whichever wayit is parted Ellen. I wish I had 'controllable; hair instead of the dead straight hair that I have. You've got me Dancing / Gangman styling / Harlen Shuffling / Shimmy Shimmy-ing / boogying to your music - can't wait!!!!!!!!!! Ellen you're a Champ, looking forward to seeing you Down Under!! Ellen, I guarantee you won't take so long to come back after you've visited here. We love your style and you will fit right in! Ellen coming to Australia! Couldn't be more excited! I have been a big fan going way back with her sitcom, her books and I've seen her live in Canada doing stand-up. She is just so special and has that amazing ability to make us laugh, everyday on TV! 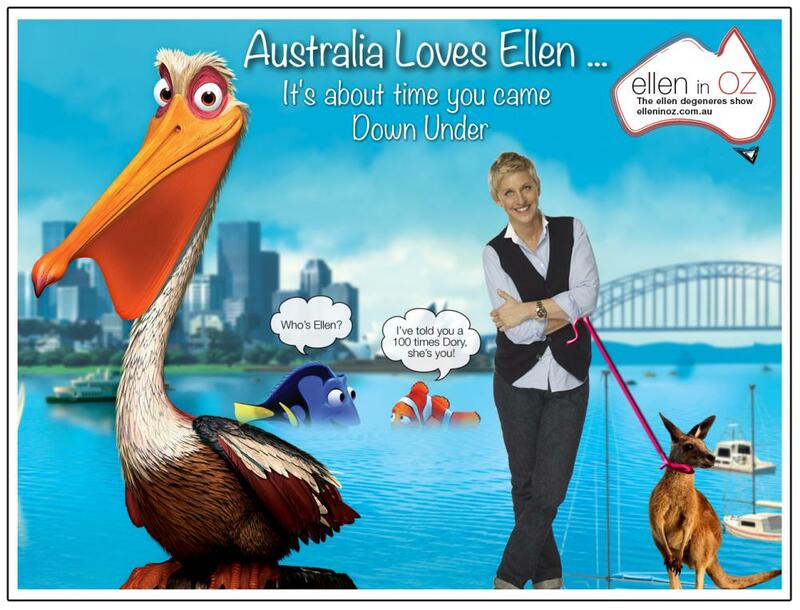 Ellen, I hope you love Australia as much as we do and that you enjoy your time here. You are so appreciated and welcomed with open arms. Your generosity and kind heart is contagious! You're like an awesome virus! I have sooooo caught it! I am so busy now infecting everyone else! LOL. LOVE LOVE LOVE you Ellen! Every day that I watch the show I am gobsmacked by how wonderful a human being that Ellen is. I had watched bits and pieces of it in the past but not a great deal. I could kick myself for being so slow on 'catching on'. Well all I can say is that I am glad that I have watched it properly and will be doing so a lot more often. Thank you ladies for this wonderful magazine. Hi Ellen, I am so pleased that you have decided to come to Australia. It is a beautiful country and I hope you have a wonderful time here. Welcome, welcome, welcome.